New Zealand comprises two main islands (North Island and South Island) and several small islands, totalling 27.1 million ha in area. About 25 percent of the land area is less than 200 metres above sea level; steep hills and mountain ranges that approach 3 754 metres often form a backdrop to this low-lying land. New Zealand experiences a maritime, temperate and windy climate. It has a population of 3.8 million people. The economy is based largely on export-oriented primary production, with agricultural products accounting for about 35 percent of total overseas trade (by value). Some economic indicators of New Zealand are presented in Table 1. Before initial Mâori (Polynesian) settlement in New Zealand about 800 years ago, most areas below the natural treeline were forested. Over 100 natural forest types covered around 85 percent of the country. Between the fourteenth and sixteenth centuries in particular, large areas of forest were burnt as the population expanded. In 1840, when the Mâori population was about 115 000 and European settlers numbered approximately 2 000, the Treaty of Waitangi was signed between the British Crown and Mâori chiefs to record the consent of the Mâori to New Zealand becoming a British colony. European settlement commenced in earnest from this time, when indigenous forests covered about 53 percent of the land area. The European settlers and their descendants saw forests as both an obstacle to agriculture and an inexhaustible source of timber. Pasture increased from less than 70 000 ha in 1861 to 4.5 million ha in 1901. By 1920, most of the current 11.9 million ha of agricultural land had been cleared. This was the primary cause of the decrease in natural forest cover to the current 6.3 million ha or 23 percent of New Zealands land area (Ministry for the Environment 1997). Table 2 details current land uses, while Figure 1 shows the distribution of plantation and indigenous forests. Approximately 16.8 million ha of the total land area is under private ownership and 10.3 million ha belong to the government. * GDP = Gross domestic product; on 1 August 2002, NZ$1.00 = US$0.47. ** Year ended June 2001 (provisional). * Mostly land with no potential for sustainable production, towns, lakes, rivers and unclassified areas. New Zealand is geographically isolated from major world markets, so innovations to increase productivity and competitiveness are cornerstones to survival and growth, including plantation forest development. Fertile soils, abundant rainfall in most areas and few temperature extremes, provide ideal conditions for growing trees. In addition, no part of the country is very far from a seaport. Timber has always played a significant role in the New Zealand economy, and in the early development of the country it was the principal export. Many of New Zealands small towns started as lumber camps. As European settlement increased, a strong local timber market developed with wood required for housing, fuelwood, fencing, gold mining, construction and, in due course, railway sleepers. The indigenous timber industry reached a production peak in 1907 and then declined as the prized kauri (Agathis australis) forests were logged to near extinction. The development of a plantation-based forest industry began with the establishment of a State Forest Service in 1919. There are now 1.8 million ha of plantation forests. Plantations cover seven percent of New Zealands land area and comprise 29 percent of the total forest area. Forestry directly provided jobs for 24 300 people or 1.3 percent of the total number of people employed (as at February 2001). Provide employment for an additional 20 000 people. From 1919 to March 1987, the governments commercial forestry operations were administered by one agency, the New Zealand Forest Service. In the mid-1980s, New Zealand underwent radical reforms moving from a regulated to a market-based economy, and there was significant re-organization of government agencies. In 1987, the government announced its intention to sell its entire plantation forest estate. This involved 550 000 ha, or about half of New Zealands plantation forest resource at the time. The Department of Conservation manages the governments indigenous forest estate. The Ministry of Agriculture and Forestry has policy, sustainable development, forest health and protection (quarantine) functions. Forest research is carried out under contract to government and private enterprise. Generally, New Zealand has enjoyed stable and transparent governments with sound legal, policy, planning and institutional frameworks in all sectors. This played a significant role in encouraging overseas investment in forest assets. Central government now controls a mere three percent of the countrys plantation forests. State-owned enterprises and local government control another three percent each. Through the sales process, the face of New Zealand forestry has become more diverse and international. There are 20 companies that each manage more than 10 000 ha of forest. Small-scale growers are increasing their presence. Increased competition and greater exposure to international market fundamentals have enhanced the industrys competitiveness and its contribution to the New Zealand economy. The governments focus has shifted from direct involvement in the industry to promoting economic and regulatory environments in which the forest industry acts for itself wherever possible - to seize economic opportunities, protect and enhance the environment and, in the process, to advance New Zealands social goals. New Zealand has no national forest policy at the moment. The Resource Management Act 1991 sets the legislative framework for the sustainable use, development and protection of land, air and water resources. It is implemented primarily at the regional and district government levels. A 1993 amendment to the Forests Act 1949 requires indigenous forests on private land to be managed under approved sustainable forest management plans or permits where timber is to be harvested, and sawmills processing indigenous timber to be registered. The amendment also introduced further controls on the export of indigenous timber products. As early as the 1870s, concern was developing over the rapid rate of indigenous forest depletion. Some leading politicians recognized that the indigenous forests were not inexhaustible and future demands would have to be satisfied by imports or plantation forests. The first forestry legislation was passed in 1874 in an attempt to limit deforestation. It did not endure against the dominating view that forests impede the development of agriculture. Further legislation in 1885 set aside state forests, established a school of forestry, and appointed forestry staff. The interest shown in forestry at that time was again short-lived. Apart from early European settlers efforts to provide shelter or beautify some treeless areas, tree planting took place only from 1871, encouraged mainly by local governments. Central government afforestation took place from the late 1890s under the Lands Department, and about 16 000 ha were planted by 1919. In 1913, a Royal Commission on Forestry identified some of the main forestry and timber problems, and predicted that the growing demand for timber would exhaust the supply from the indigenous forests in approximately 50 years. The First World War delayed implementation of the Commissions recommendations, but also highlighted the importance of adequate timber supply. In 1919, the newly established State Forest Service incorporated exotic forestry, indigenous forestry and indigenous forest regeneration under its responsibilities. Further and enduring legislation was passed in 1921 and 1922. These initiatives provided a boost to forest management and afforestation. The assessments of indigenous timber resources and future domestic timber demand, and the concern that the indigenous forests would be depleted, led to the adoption of large-scale afforestation by the government. This was accompanied and supported by technological developments that significantly improved the economics of forestry and lowered the risks. Growth and yield performance led to radiata pine becoming the species of choice. Between 1925 and 1936, about 288 000 ha were planted. Initially this was a government undertaking, but once the financial rewards and technologies were firmly established, the private sector quickly responded and contributed significantly to the planting boom. The largest afforestation company (New Zealand Perpetual Forests Ltd.) planted 68 000 ha during this 12-year period. From 1936 to about 1960, little planting was undertaken. Initially this reflected a review of Forest Service Policy that noted the prominence given to exotic plantations in the preceding years. A more balanced approach was subsequently pursued to complete the establishment of existing forests, rather than focus on the silvicultural treatment of indigenous forests. Another important factor was the 1937 discovery of a remedy (cobalt) for so-called bush sickness on the pumice lands of the central North Island that had severely restricted the development of agriculture. This land was ideal for forestry and was where most of the large-scale afforestation had taken place. With the discovery of a cure, the prospects for further large-scale afforestation diminished. Mistakes were also made in these early plantings with poor siting in particular leading to extensive failures of radiata pine and other species. A major fire and an insect epidemic over a large area were other factors that caused foresters to reflect upon appropriate management practices. The 1940s and 1950s were also times of great change for processors and end-users who had been accustomed to high quality, indigenous timbers, but were now increasingly faced with non-durable pine from untended early plantings, which contained many defects. The State Forest Service devoted considerable attention to utilization issues. With the significant production and demonstrated returns from plantations, the building of a processing sector utilizing plantation-grown timber, plus a re-assessment of future demand and the desire to create an export industry, the government initiated a second wave of planting in the early 1960s. This time the circumstances were somewhat different - the government also needed to provide political support and financial incentives apart from demonstrated returns and adequate information. Since 1960, the government progressively introduced a range of support measures to accelerate tree planting on private land. As with the first planting boom, this expansion was driven by the Forest Service. Again, the planting was largely with radiata pine. The ever-increasing amount and complexity of the government incentives to forestry characterized this period from the early 1960s to the mid-1980s. The plantation estate grew from 352 000 ha in 1960 to over one million ha by 1984, of which nearly half was on private land. Deregulation in 1984 changed the New Zealand economy from one of the most controlled to perhaps the most open economy in the world. Direct incentive schemes were terminated, extension services became cost-recoverable and significant changes were made to the taxation regime that applied to forestry. The governments commercial forestry activities were initially corporatized, then privatized in the early 1990s. This combination of events resulted in a dramatic drop in new planting. By 1992, the bulk of the governments plantation forest assets had been sold. Further changes to the taxation regime were introduced and the government actively promoted forestry investment, mainly through the provision of information. Development of the supporting infrastructure, such as ports, railways and bridges, in most regions was another key facilitating factor. Declining agricultural product prices and land values also had an important influence on the competitiveness and profitability of forestry. Agricultural landowners recognized the value of forestry in diversification and sustainable management. Most importantly, a global price spike for logs in 1993 and 1994 drew unprecedented interest in forestry. These factors buoyed private investment and were important in attracting foreign investors and forest managers, who brought capital, plantation development expertise, technology and crucial access to foreign markets. As a result of these influences, new plantings surged to record levels during the mid-1990s. The last few years have seen planting decline to a perhaps more sustainable long-term rate as log prices returned to more traditional levels. Having progressed successfully from public plantation development and ownership to private corporate ownership and expansion, the industry has now moved into another phase where the majority of the new planting is on small woodlots and plantations by private landowners and partnerships. A further sign of the maturation of the industry is the presence of professional organizations and sector associations in the processing and marketing arenas, as well as the constructive working relationships that have been built up over time with key stakeholders - the government, research organizations, civil society and environmental groups. In numerous localities where the indigenous timbers, first the kauri, and later those outside the kauri country became exhausted all that remained as a reminder of once flourishing sawmilling centers were ghost settlements and often not even that. With our predominantly radiata exotic plantations, however, we now seem to have somewhat of a paradox - new and apparently permanent prosperous towns the economy of which is based entirely on these plantations (Simpson 1973). The history of plantation forestry development in New Zealand has run in parallel with a gradual change in the mindset regarding tree planting. From being appropriate just for waste land (i.e. land unsuitable for agriculture) and marginal land, plantation forestry is now being actively pursued as a profitable enterprise able to compete for land with any other activity and contribute to sustainable land management. New Zealands plantation forests of 1.8 million ha continue to grow at around 30 000 to 40 000 ha per annum, and are 91 percent privately owned. Radiata pine (Pinus radiata) accounts for 89 percent of the plantation area, Douglas fir (Pseudotsuga menziesii) another six percent, other softwoods (mainly Pinus spp.) two percent and hardwoods (mainly Eucalyptus spp.) three percent. The plantations are managed primarily for industrial roundwood production, although some smaller areas are maintained for soil conservation purposes. An accord signed between the industry and environmental groups in 1991 recognized commercial plantation forests as an essential source of perpetually renewable fibre and energy, offering an alternative to stop the depletion of the natural forests. At the same time, it also acknowledged the importance of protecting the existing native biodiversity. Until 1840, the New Zealand timber industry depended on the harvesting of Mâori-owned indigenous forests. The provincial government in the Canterbury region of the central South Island was the first to encourage tree planting by passing the Planting of Trees Ordinance in 1858. This was mainly to develop on-farm wood resources on leased land in significant treeless areas. The ordinance permitted tenants to plant trees on their land and reimbursed them for the trees if the leases were terminated (see Annex 1 for summary of developments during this period). By 1870, increasing concerns about the depletion of the indigenous forests led some politicians to acknowledge that future demands for industrial wood from these sources would have to be supplemented by imports or plantation forests. However, the governments primary objective of promoting European settlement and rapid economic development took precedence over any concerns about the rate of deforestation. Most of the land clearance by Europeans took place between 1870 and 1920. Two reports submitted to the government in 1870 recommended incentives for the planting of trees and provided the initiative for the Forest Trees Planting Encouragement Act 1871. This was particularly targeted at the treeless Canterbury Plains and Central Otago in South Island, where trees were needed for building materials, railway sleepers, fuel and shelter for stock and crops. Under the provisions of the Act, farmers were entitled to a free land grant of two acres of wasteland for every acre of freehold land planted with suitable trees. The government also encouraged tree planting on state land by reducing the rents of tenants who planted trees on their leaseholds. The Act was never fully implemented, nor was it particularly popular with the farmers. By 1877, only 622 acres were planted in Canterbury compared to 1 300 acres that had been planted independent of the Act on private land by 1871. The first Forests Act (1874) was an attempt to halt the indiscriminate destruction of indigenous forests and establish a forest department specifically focused on ensuring a long-term supply of (indigenous) timber. It provided £10 000 for ten years to be spent on forest management, which included planting. However, the first forest conservator, appointed in 1893, saw only a small role for the government in plantation forestry. Government forestry was also seen to be in conflict with settlement aspirations, and the legislation failed after three years. Under the State Forests Act of 1885, the revenue from harvesting indigenous forests was placed in a dedicated State Forests Account from which the costs of plantation forestry could be drawn. The legislation also offered subsidies to local government for establishing plantations. Once again, however, the brief interest in forestry did not endure and the State Forest Department was dismantled in 1887. Since 1871, large grants of government land were made available to district councils for afforestation purposes. In return, the councils were expected to provide seedlings and funds, and undertake forest establishment, which was difficult to achieve. It was eventually agreed that planting should be gradual and that the areas where planting was deferred could be leased to provide revenue to defray some of the costs. Provincial governments also sought to increase private planting by issuing a land order of £4 to anyone who successfully planted one acre with any type of tree. This scheme lasted for 20 years. It was particularly popular in Canterbury and Otago where the establishment of shelterbelts to provide protection from the prevailing northwest winds was valuable to farmers. Some of these plantations were up to 200 or 300 acres of largely radiata pine or Cupressus macrocarpa. Continuous, small-scale planting, partly funded in this way, provided the foundation for the Canterbury Plantation Board to become New Zealands first plantation forest management agency. Tree planting subsidy schemes had stopped in the early 1890s. By this time, planters had identified species with superior yield potential including several pine species, Douglas fir, eucalypts, cypresses and, in particular, larch (Larix spp.). Advice and direction should be afforded by the government to assist private planting for forestry purposes. The government responded in 1896 by establishing an afforestation branch within the Lands Department, and the first government-organized afforestation commenced. The government implemented an annual planting programme that focused on land in the central North Island volcanic plateau, considered deficient for farming. The first tree nurseries were also established. Fifty-four acres were planted in 1898 and numerous trials were established to compare indigenous with exotic species and determine the most suitable trees for plantations. Initially, labour constraints hindered the expansion of plantation forestry, but tree-planting prisons were established and convict labour was used until 1920. By 1904, afforestation was up to approximately 1 000 acres of new planting per year. Planting was targeted at government land near railway lines where there was little existing adjacent forest. By 1908, 9 465 acres of plantations were established. These plantings illustrated that exotic plantations were technically feasible, although the cost of establishment was high. The average figure was £20/acre (approximately NZ$5 970/ha in December 2001 values). In the early 1900s, the quality and quantity of indigenous timber were diminishing rapidly. It was estimated that the supply was likely to be exhausted in less than 70 years (Kensington 1907). Demand for wood was also growing quickly. Between the turn of the century and 1908, imports had increased fivefold despite indigenous timber production doubling over the previous ten years. A Royal Commission on Forestry set up in 1913 recognized the limitations of the indigenous forest to meet future timber supply, the unsatisfactory fragmentation of forestry administration and a lack of interest in afforestation by the administrators. The Commission suggested that indigenous species, and even the most commonly planted exotic at that time - larch, were unsuitable for plantation purposes, but did note that Pinus radiata was being raised in quite insufficient numbers. The strong performance of pine species in New Zealand was becoming evident. Its roles in controlling erosion and stabilizing sand dunes were also recognized. In 1908, the government responded to industry lobbying by introducing reduced rail freight rates for timber, which cost the government between £25 000 and £35 000 (approximately NZ$3.0 to 4.2 million in December 2001 values). Forestry was given a considerable stimulus when the government began supplying seedlings to settlers at cost price for farm planting as early as 1916, and assisted further through the provision of extension. The repatriation of 1914-1918 soldiers, an increase in the number of marriages, higher wage rates and a general feeling of prosperity, all led to a high demand for construction timber. This situation was fuelled by substantial government housing subsidies for returned soldiers. During, and for some years after the war, discharged soldiers were also eligible for grants of forest trees for farm purposes. The growing concern over the fate of New Zealands indigenous forests resulted in the introduction of wide-ranging regulations in 1918 to control timber milling and exports. The Minister of Forestry was empowered to set the maximum production at each sawmill, require millers to report their activities and impose a system of export and domestic price controls. Later, export quotas were introduced and permits required for timber exports to control domestic prices with the aim of conserving New Zealand timbers for New Zealand use. The period was notable for the gradual change from viewing indigenous timber supply as inexhaustible to a realization that existing forest resources were inadequate to meet the countrys future needs. Accordingly, increasing government involvement in the forestry sector took place. Development and implementation of forest policy and legislation were severely constrained by the European pioneering attitude that saw forests as obstacles to settlement and agricultural development. While land settlement reached its peak around the turn of the century, forestry continued to be perceived only as an alternative where agriculture was uneconomical. The government attempted to address these issues many times, but overall political support was weak until the end of the period. Land grants were the principal direct means of encouragement for plantation forestry. Initial steps by the government to develop a viable industry and knowledge on afforestation, and the gradual refinement of cost-effective planting techniques, provided some indirect incentives. By 1918, a toehold of some 13 000 ha of plantations had been established, most of it encouraged, but not owned, by the government. Fragmentation in government administration hinders the development and implementation of effective policy for land use and industry. In 1919, the State Forest Service was formed, and experienced, trained, professional foresters were appointed to senior positions. The Forest Service initially adopted a new policy direction away from afforestation, export restrictions and price controls, and towards a more comprehensive government forestry programme focused on sustainable management of indigenous forests. It was believed that this would be enough to assure future supplies of timber for the country. The first national forest inventory, carried out between 1921 and 1923, revealed that five million ha, or around 20 percent of the country, could be classified as forest land, of which only 45 percent (2.24 million ha) was merchantable. Furthermore, the 1925 annual report of the Forest Service estimated the total economically available indigenous softwoods at around 60 million m3, and the per capita consumption of the 1.35 million inhabitants of New Zealand at a little over 0.5 m3 per annum. Based on population trends and the expansion of industry, particularly agriculture, it was further calculated that by 1965, the national demand for sawntimber would be 1.6 million m3, and that New Zealands virgin softwood supplies would be exhausted by 1970. These results forced a policy rethink. Timber product substitution was not considered feasible, and increasing reliance on imports was perceived as costly and creating an unwelcome dependence on overseas supplies. Despite the uncertainties of large-scale afforestation, it was viewed as the only solution, and from 1925 onwards afforestation became a central plank of forest policy. Thus, the conclusions of 20 years earlier were reconfirmed and the afforestation solution was pursued with renewed vigour. This became the rationale for the extensive government forest planting and the incentives to encourage private companies, local authorities and private individuals that followed. An official report calculated that about 238 000 ha of radiata pine planted over a 34-year period would be needed to supply expected demand, assuming no remaining indigenous forest resources. A new afforestation strategy was announced, which recommended that the 5 200 ha of government plantations that existed in 1925 be increased to 120 000 ha by 1935 to meet New Zealands timber needs from 1965 onwards. The early learning phase had provided much of the groundwork that allowed planting on this scale to be contemplated. An improved seed collection service was introduced in 1923 to counter the impacts of poor, and inconsistent, tree-form characteristics. Silvicultural research efforts had focused on ascertaining the most appropriate time to plant, spacing, maintenance of soil fertility, shade requirements and fertilizer response. A separate stream of research was concerned with insect pests and fungal diseases of trees. Forest product research, including kiln-drying, physical and mechanical properties of various timbers, timber treatment and preservation, and pulp and paper potential, began in 1921. By 1925, when the first planting boom occurred, there were already some five or six years of useful results from government-conducted research to draw from. Dedicated forestry schools were also established in Canterbury in 1925 and Auckland in 1926, although both closed in the early 1930s. From 1921 to the end of 1930, the sale of seedlings at cost price from government nurseries for private planting was also given considerable emphasis, and resulted in a significant number of trees being planted. In 1927 alone, some 4.8 million trees were supplied from government nurseries to individual landowners. Much of this planting was for shelter and on-farm uses, rather than for commercial returns. The government ceased to supply seedlings in 1930 after submissions from the Nurserymens Association that considered it to be unfair competition. From 1921 to 1930, the State Forest Service employed a North Island and a South Island officer whose role was to travel the country giving addresses and dispensing advice on tree planting. This was supported by extensive Forest Service research into the growth, yield and potential of various exotic species, although a forest research institute was not established until 1947. Improvements in afforestation and planting techniques, particularly between 1921 and 1924, reduced the cost of establishing plantations from £26.18/acre in 1918 to less than £2/acre in 1925. This eliminated one of the principal objections to afforestation - that it was uneconomical. The goal of 120 000 ha by 1935 became a national policy. Direct sowing of tree seeds and wider spacing between planted seedlings were also introduced. By the mid-1930s, the cost of planting in the central plateau, where half of the planting was taking place, remained at around £2/acre (approximately NZ$408/ha at December 2001 prices). Convict labour comprised the bulk of the labour force used in government afforestation up until 1921. This was supplied free-of-charge to the Forest Service at first, but for about six years until 1921 the Forest Service (and its predecessor) was charged the actual cost of maintaining the convicts, which illustrates the true cost to government. From 1921 onwards, the Forest Service no longer used convict labour, and workers were drawn instead from the ranks of the unemployed. During the Great Depression, subsidized work relief programmes gave considerable stimulus to the governments afforestation programme. Tree planting under public works relief schemes was widespread during the 1930s and the target of 120 000 ha by 1935 was exceeded by 25 percent in 1934. Another government response during the Depression was to provide a subsidy for construction of houses equivalent to 33.3 percent of wages up to a maximum of total construction cost. This had obvious linkages to the timber industry. Freight rate concessions were also available. Government plantation establishment was financed by loans with compounding interest, rather than annual appropriations. Combined with forest revenues that could be applied to non-planting purposes, annual receipts were consequently insufficient to meet accumulated debts. In one of the worst cases, the expected yield from Dumgree Forest established in 1903 was less than five percent of the accumulated debt, largely due to compounding interest. Between 1927 and 1932, exotic pine production increased from 17 500 to 32 000 m3, although still only representing six percent of total production. Twenty percent of this exotic production came from government forests and was typically used domestically for poles, sleepers, mine props, posts, battens and fuel. A new forest policy in 1934 de-emphasized the importance of expanding the plantation estate, and large-scale forest planting ceased. Exotic plantations were seen as supplementary forest resource capital. In view of subsequent events, the reasons are worth noting. Firstly, halting large-scale plantings was perceived to be appropriate because it was considered that plantation resources were sufficient to supplement indigenous forests for the next century. In addition, surplus exotics were envisaged to be export oriented and therefore would not be competitive in the international market. Diversification was also emphasized so that no species would form more than 30 percent of the total resource. This strategy had been given impetus by outbreaks of the wood wasp (Sirex noctilio) and fungal infections. A more limited afforestation programme continued, partly to reduce the proportion of radiata pine from its 40 percent level in 1934 to the 30 percent target, and partly to improve the age class distribution. Concurrent with the government forestry expansion was a private forest-planting boom, although for very different reasons. Initial work by the Forestry Branch of the Lands Department and subsequent research undertaken by the Forest Service provided knowledge on species suitability, growth rates and planting techniques. Consistent with research results on the performance of the governments exotic species plantations, the harvest of some older private exotic forests and shelterbelts resulted in attractive returns. The investment potential of plantation forestry had been demonstrated. In response, several private companies were formed after 1923. These new afforestation companies benefited from the governments experiences, and were speculating on reaping the financial rewards of the new industry. Besides special-purpose afforestation companies, other enterprises with an interest in securing a long-term supply of timber were attracted to the governments tree-planting efforts. These included some sawmilling companies and other wood users. Capital was raised by means of bond sales through public offerings. Combined with the governments efforts to encourage plantation forestry, significant new private plantings took place. When the Great Depression commenced in 1929, the New Zealand timber industry was already in recession. From 1928 to 1934, timber prices fell due to oversupply from the indigenous forests and competition from imports, even though the government withheld timber from sale to support the private industry. New Zealand timber was increasingly displaced by imported timber such as Douglas fir, cedar and redwood, despite increasing import duties on timber. 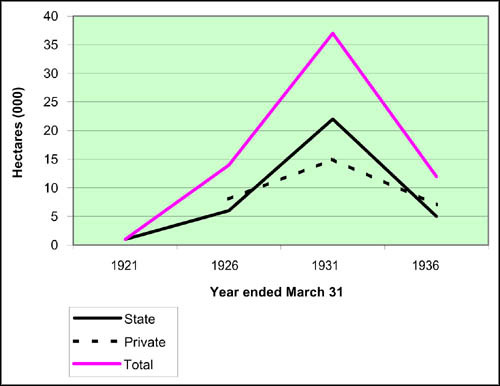 This trend eventually spelt the end for many companies, and new plantings by surviving companies fell steadily during the early 1930s (Figure 3), mirroring the fall in the government plantings, but for different reasons. Abuse of the bond-selling system by private companies eventually led to its abolishment and to changes in the legislation governing companies in 1934. This accentuated the decline in private planting. The formation of the State Forest Service, an inventory of the natural forest resource and assessment of the countrys future timber demand laid the foundations for plantation forestry in New Zealand. The Forest Services main objective was to ensure an adequate, long-term timber supply. Substantial areas of government and private plantations were established. Throughout the 1920s and 1930s, the government implemented forest policies that provided both direct and indirect incentives for the development of the forest industry. In addition to a government afforestation programme, these measures included a government extension service, the development of forest management techniques, research, unemployment relief, housing subsidies and price controls. This was very much an experimental phase. A number of extensive planting failures occurred where radiata pine was planted on inappropriate sites. Afforestation was concentrated on land not suitable for agriculture and, in a number of cases it was also poor for commercial forestry. Some plantations were destroyed by fire. The inadequate age class distribution was another concern. Eighty percent of the Forest Services radiata pine forests and 50 percent of the private forests were established between 1927 and 1931. This posed significant management problems. Importantly, though, for the development of the plantation forest industry, the government bore the bulk of the costs associated with this experience. By 1938, both government and private planting had effectively ceased, and most of the plantation estates were between nine and 13 years old. With experience and research, new opportunities became available, such as the emergence of viable export products. Afforestation, particularly private planting, was limited during the 1940s and 1950s. Meat and wool farming were especially buoyant during this period and tree plantings on farms were unable to compete when, at the same time, the government was maintaining timber price controls. In addition, the governments focus moved away from plantation development to processing. From 1939 to 1958, the total area planted reached only 55 000 ha. Private planting picked up only during the latter part of this period and accounted for 16 000 ha (29 percent) of the total. The planting of radiata pine during the 1920s and 1930s in concentrated areas provided large quantities of relatively uniform raw materials in the late 1940s. The advantages gained - low logging and transport costs, and bulk marketing - were important to the development of the processing industry, and outweighed the disadvantages of poorer wood quality from untended radiata pine stands. The Forest Services involvement in commercial logging and processing was very important in consolidating the economics of plantation forestry and expanding the demand for products from the developing plantation resource. In 1939, the government commissioned a large sawmill near Rotorua, adjacent to the major central North Island plantings. Another major government sawmill, Conical Hill, began operating in South Island in 1948. These sawmills served as demonstration and development units for production and marketing techniques for the sale of exotic plantation-grown timber, and in having radiata accepted as construction timber. The industry was quick to follow with a major private company (NZ Forest Products Ltd.) commissioning an integrated sawmill-structural board plant in 1941 that utilized radiata pine. Research was required to develop grades and to determine seasoning, preservation practices, strengths and physical properties of plantation-grown timber. In 1948, the Forest Experiment Station (now Forest Research) at Rotorua was established by the government as the base station for a national indigenous forest inventory, but its work soon extended into exotic species. The value of a centralized research institution was quickly illustrated during a sudden epidemic of the Sirex wood wasp in the late 1940s. The first commercial pulping of radiata pine commenced in 1939 by Whakatane Board Mills. In 1943, as part of a National Pulp and Paper Scheme, the government approved the establishment of a newsprint and pulp and paper mill. A change of government in 1949 resulted in a policy shift favouring private over public ownership. In 1952, the government signed an agreement with the Tasman Pulp and Paper Company, and a pulp and paper mill was established at Kawerau in central North Island. An important aspect of this arrangement was the degree to which the government, as the owner of the wood resource, made the venture as attractive as possible by selling a very large volume of wood at low stumpage prices, effectively subsidizing the mills profits. Weighing the benefits of establishing a plantation industry - with associated downstream processing facilities - against the cost of selling the logs at below-market value would have been a difficult exercise and was very much a political decision. In essence, The direct and secondary benefits to the community are, politically, close to being irresistible, while below-market pricing of logs is practically invisible under most systems of Government accounting (Kirkland and Berg 1997). The government also agreed to: (i) construct many miles of new roads and a modern port facility at nearby Tauranga; (ii) supply energy from hydroelectric power stations and (iii) establish railway lines to link the plant with the existing rail network and new port. It constructed over 700 rental houses and 550 one-man huts for the workforce, plus all necessary town services. The £14 million cost (approximately NZ$511.8 million at December 2001 prices) to the government for providing this support represented almost 50 years gross revenue under the terms of the sale agreement. This was before the additional cost of the low stumpage price was factored in. Furthermore, the contract was effective for 75 years and thus locked the government into providing wood from yet unplanted forests. By comparison, NZ Forest Products Ltd. initiated parallel development of an integrated sawmill and pulp and paper mill in 1949 without direct government participation. This was based on its almost equally extensive exotic forests in central North Island and commenced operation in 1953. In 1957, the first log shipment in 50 years went offshore, this time of radiata pine. Exotic sawntimber production exceeded indigenous production for the first time in March 1960. Tax relief was provided from 1949 to farmers who had forest plantations. This allowed expenditure incurred in planting, protecting and maintaining shelterbelts and woodlots, to be charged against income for tax purposes. In addition, farmers were able to spread income from the sale of farm trees over five years to mitigate the impact of higher marginal tax rates. The standing value of trees did not increase the assessment for land valuation and local tax rates. Little planting by farmers was undertaken, however. In 1936, the government had established a Timber Price Committee due to demand exceeding supply following the end of the Depression. The Committee set standard timber prices through negotiations with sawmill representatives. Demand was further increased by the start of the Second World War and the government assumed even greater powers by appointing a Timber Controller with authority to undertake the sale, purchase and cutting of any trees. After the war, demand for new housing outstripped supply until the mid-1950s. Building permits for dwellings rose from 1 634 in 1943 to 10 356 in 1945 and 1946. Government price controls were continued to address a significant backlog of construction needs, and to ensure affordable housing. They applied to both indigenous and exotic timbers, and kept stumpage payments low. These controls slowed down the anticipated shift from indigenous to exotic timber, as did the continued access by sawmillers to private indigenous forests. A government scheme introduced in 1946 that allowed sawmillers to provide subsidized housing to attract workers into the countryside was also likely to have benefited the indigenous forest industry more than plantation forestry. Under the price controls, valuable indigenous timbers were available at the same prices as radiata pine, with minimal price differences across timber grades. Throughout the 1950s, the Forest Service and private forest companies argued that such price controls needed to be removed if exotic plantation timber was to have any chance of substituting indigenous timber. Price controls were considered a significant disincentive to tree planting. The government, however, was more concerned with ensuring low-cost timber for housing and employment opportunities, and timber price controls were not removed until 1965. The government also regulated the supply of timber. A major new national forest survey of the indigenous resource (1946 to 1955) provided high quality information on the resources and composition, condition and ecology of the forests. Only 0.8 million ha of the estimated 5.8 million ha of indigenous forest were considered suitable for timber utilization. The results confirmed that timber supplies from indigenous forests could be sustained at the current rate of harvest for only a few more decades. The government consequently accepted that sales of timber from indigenous forests should be reduced. The focus of this period was on the utilization of the maturing plantation trees, with only limited further plantation development. Notably, a new Director of the Forest Service appointed in 1939 was a forest product engineer. The impacts of the earlier planting were significant as a very large volume of poorly and rapidly grown wood, mostly radiata pine, began to replace the high-quality native timbers that had been used so successfully for the previous hundred years. Access to large, concentrated volumes of uniform plantation wood that could be harvested easily overcame the disadvantage of poorer quality relative to wood from indigenous forests. In some respects, New Zealands extensive plantation forests had been grown speculatively, and this was the period of developing a better understanding of their management, the wood properties and their utilization potential. The government responded by providing significant subsidized development of the infrastructure necessary for processing the wood. Taxation incentives on their own were insufficient to persuade farmers to adopt plantation forestry. The large increase in plantation wood in the mid-1950s from the first planting boom gave rise to strong growth in the industries and trade. The anticipated demand from these new industries triggered perceptions of further future wood shortages. Another assessment of New Zealands future wood supply needs was undertaken for the government. Its report in 1959 predicted a deficit of 5.4 million m3 in 2000. This assessment stimulated a second major afforestation effort. Much of the planning was also based on developing an export capacity. From 1959 onwards, the Japanese log trade increased significantly. It was delivering prices well in excess of what was available in the domestic market, and made forestry a more competitive and profitable form of land use. A threefold increase in planting was proposed and in 1960 the government approved a new planting programme of 400 000 ha by 2000, principally aimed at creating a major export industry. Annual planting targets were steadily increased from 9 000 ha/year in 1959 to 28 000 ha/year in 1972. Unoccupied land available for either agriculture or forestry was limited and it was recognized that the government (through the Forest Service) could only contribute to part of the target. It was envisaged that the government and the farming community would need to contribute equally to achieve the required level of new planting. This meant winning the support of a farming community that was, in general, wary of any further plantation expansion. Initially, the targets of the planting programme could not be met because the government had difficulties in purchasing sufficient land for planting, and because of the farmers limited interest. Price controls, still in effect until 1965, were another obstacle to afforestation. A small farm forestry movement had been initiated in the late 1950s and achieved some success in promoting small-scale forestry and the use of a more diverse range of exotic species. Despite the governments promotional efforts, however, these efforts were not enough to encourage sufficient numbers of farmers to plant trees. Similarly, the exemption of the timber value of trees from estate duty in 1960 had little effect. Moreover, financial institutions were reluctant to provide loans to forestry enterprises because of their inexperience with such investments. More direct incentives were considered necessary, and were quickly and increasingly brought into play. 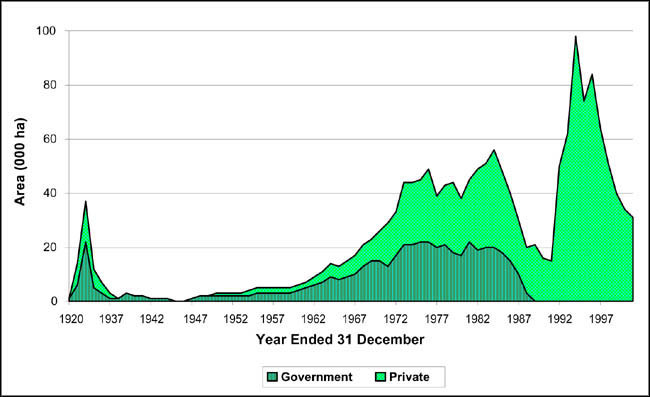 In 1972, planting by the private sector exceeded that of the government for the first time since 1939. For the first time, forestry was actively promoted by the Forest Service as a legitimate land use in its own right, and began to compete with agriculture for more productive land. The Forest Service devoted considerable time and resources to promote the benefits of forestry as a land development option that complemented agriculture. It also supported research on the relative profitability of farming compared with forestry, and provided technical advice through a nationwide extension service. However, impediments to expansion remained, the most important being prevailing attitudes and the legislative environment. The increased rates of tree planting in the 1970s resulted in a vigorous farming versus forestry versus the environment debate. Although afforestation was concentrated on cutover indigenous forest and poorer quality farmland, many in the agriculture (livestock) industry still strongly viewed plantation forestry as a waste of good land. This was particularly focused on large-scale plantation forestry undertaken by private corporations and the government. Other arguments against plantation forestry focused on the disruption of existing rural communities by a new land use that changed the social structure and supporting services. Typically, forest workers were younger, often single, and were concentrated in fewer and larger towns. Large-scale plantation forestry did not involve family ownership and land management. It was blamed for increasing urban migration and thus the consequential loss of education, health, transport and other social services in rural areas. Farmers expressed fears of becoming surrounded and isolated by plantations because they could not compete with the corporate sector in purchasing land. However for those who sold their land, forestry provided an additional and welcome exit opportunity in many cases. The situation was compounded by a general disinterest in forestry among the agricultural community. There was little interaction between the forestry school (established in 1970) and the agricultural universities. Courses in agroforestry were only introduced into the agricultural universities in the 1980s. Consequently, farm advisers, trained in livestock production techniques, had little experience or interest in promoting trees. The farming versus forestry debates also continued in the statutory planning arena, particularly under the Town and Country Planning Act (1977), and polarized the parties involved. The Act listed the protection of land having actual or potential value for food production as a matter of national importance. This was supposed to control urban development on high-quality agricultural land, but the provision became a convenient mechanism for local authorities to justify the control of plantation expansion. Throughout the 1980s, this restriction had a significant, although unquantifiable, impact on the development of plantation forestry while agriculture remained largely free of any controls. Prior to 1962, farmers found it difficult to obtain finance for forestry purposes. The government introduced Forestry Encouragement Loans under the Farm Forestry Act (1962). Landowners could borrow money for up to 20 years at an annual interest rate of five percent (inflation at the time was three percent per annum), including a provision for insurance up to the amount borrowed. Loans could be sought for the establishment (£25/acre or approximately NZ$1 871/ha in December 2001 values) and tending (£15/acre or approximately NZ$1 123/ha in December 2001 values) of areas from five to 100 acres (2-40 ha), over a five-year period. The amount was intended to cover the full cost of establishing a small forest or farm woodlot. Half of the loan and half of the interest were refundable after 20 years if the plan was implemented satisfactorily. Priority was given to areas with high timber demand, close to population centres, and where forest industries were present or expected to develop. Despite these measures, the area planted remained significantly below target. In 1965, the Farm Forestry Act was modified and renamed the Forestry Encouragement Act. With this amendment, local governments could take advantage of the terms and request loans for up to 40 years. The rate of interest payable on new loans was reduced to three percent, with interest only charged on the non-refundable half of the loan. Another option was provided to compound interest up to the point where the forest began earning income. The limit of 100 acres (40 ha) as the maximum area able to be planted over a five-year period was removed to enable greater areas to be planted with the approval of the Ministers of Forests and Finance. In 1962 and 1963, 57 planting loans and 11 tending loans were provided. This rose to 100 and three respectively by 1966/1967, but still the area planted remained considerably below target (Table 4). Amendments to the Forestry Encouragement Loans were made virtually every three years, when the maximum loan finance and interest rates were varied to account for inflation. It is unclear why the areas planted were such small proportions of the area for which loans had been granted. The economics showed the planting under the loan scheme to be considerably cheaper than that carried out by the Forest Service. In 1969, the government concluded that the rate of planting under the loan scheme was unlikely to ever reach the target. Regulations providing for Forestry Encouragement Grants were introduced in 1970 to gradually replace the loan scheme. Under the new plan, individuals, trusts, partnerships and smaller companies whose qualifying expenditures did not exceed NZ$200 000 per year (approximately NZ$2 185 000 in December 2001 values) were entitled to receive annual cash grants equal to 50 percent of the qualifying costs of establishing new forests. A maximum of NZ$750/ha (approximately NZ$8 194 in December 2001 values) was payable and the minimum area eligible was two ha. Such incentives seemed to balance the tax exemptions enjoyed by the larger forest companies. The Forest Encouragement Loan scheme was retained for local authorities only. A maximum loan of NZ$1 200/ha was available for establishment and tending of plantations of at least two ha. Interest was charged at seven percent per year (the inflation rate in 1970 was 6.6 percent), of which 0.5 percent was to provide fire insurance. The loan and grant schemes were amended twice. In 1977, a single interest rate of 4.5 percent was introduced for new loans and the 50 percent loan refund provision was revoked. Farmers with existing loans, and whose planted forests were up to an acceptable standard, had the option to retain their loans, or cancel their existing debts fully and claim a proportion of their future qualifying costs under the grant scheme. The maximum grant amount was increased from NZ$300 to 450 (approximately NZ$1 506 to 2 260 in December 2001 values) per hectare. The Forest Service reported that the area of new plantings was falling because the grants covered only one-third of the establishment costs instead of the intended 50 percent. In 1980, the financial limits on annual expenditure under the grant scheme were removed. Protection/production grants were introduced and targeted at farmers who wished to work on their properties that needed stabilization themselves. The scheme provided grants of up to two-thirds of the establishment costs, together with half of all subsequent costs. In 1982, the government introduced the Forestry Encouragement Grants to provide equitable assistance to all landowners (Box 1). From 1 April 1983, all previous forestry incentives were withdrawn. They were replaced by a flat rate grant of 45 percent of qualifying costs. The new grants were extended for the first time to the larger companies. At the same time, the right to deduct current forestry expenditure from taxable income, which had been available to the forestry companies since 1965, was removed. The effect was to increase the governments tax revenues and create a large new expenditure item concurrently. In view of the large planting areas involved, the grants were to be controlled clerically, by random financial audits of annual claims, rather than by field inspections of forestry operations. With the introduction of the Forestry Encouragement Grants, the Forestry Encouragement Loans ended in 1983. Loan holders could choose to maintain their loans, or terminate them and receive grants for further expenditures. Many opted for the grant payments, but most local authorities continued with their loans for cash flow reasons. The Forestry Encouragement Grants scheme was ended in the 1984 budget, and replaced by full deduction of plantation establishment costs against current income for tax purposes. Transitional loans, to complete the development of existing plantations, were available to previous grant holders through the Rural Bank. Protection/production grant holders remained eligible for grants of up to 39.4 percent of qualifying costs until 1990/1991. Repayments on individual farmer loans (last loans approved in 1970) could last until 2010. Local authority repayments (last loans approved in 1970) could last up until 2023. The current total value of outstanding loans is NZ$34 million, including NZ$19.5 million of capitalized interest. Nearly 200 Forestry Encouragement Loans were approved over the 20 years of the schemes operation. The total area planted under the scheme was 20 000 ha. More than 3 000 Forestry Encouragement Grants were made over the schemes 13 years of operation. The total area planted under this scheme was 100 000 ha (Table 5). a Sources: New Zealand Forestry Statistics (2000); Ministry of Agriculture and Forestry (2001). b Data for loans and grants from annual reports of the Director-General of Forests unless otherwise stated. c Sources: Poole (1968); OBrien (1982). Costs include planting and tending. d Area planted under grant and loan schemes expressed as percentage of total new private planting. f Sources: Director-General of Forests (1982, 1983, 1984, and 1985). g This is an anomaly as grants temporarily replaced the previous taxation provisions for forestry companies. h Totals for loans and grants from McKenzie (1997). In the early 1960s, the government did not see forestry companies as significant actors in the afforestation programme. The tax regime at that time deterred shareholders from re-investing their dividends and profits into second rotations. Being ineligible for the 1960 loans, the companies were provided with a more favourable tax regime in 1965 that made afforestation more attractive to them. This change might have been influenced by the inability to achieve planting targets through more direct incentives to farmers. Under the Income Tax Act, new forest establishment was encouraged by allowing companies to make current year deductions from assessable income of expenditures incurred directly and indirectly in tree planting. While individuals did not enjoy the same benefit, they could accumulate the costs and deduct them from tax payments at the time of felling. This was known as the cost of bush. Companies that were unable to obtain an immediate tax-saving benefit could receive a tax credit refund of 45 cents to the dollar, in line with an export taxation incentive available at the time. This benefit was not available to companies that already had a Forest Encouragement Grant on the same lands. To encourage regional investment, forestry and sawmilling were eligible for up to 20 percent depreciation on any plant and machinery used primarily and directly in these activities. The exact level of depreciation was dependent on the priority status of the region as determined by the government in relation to the regions development needs. Spreading income from the sale of timber over a period of up to five years, including the year of sale. This concession was available only to farmers who planted the trees for agricultural or pastoral purposes, or a woodlot owner whose trees were planted, or maintained, under a forestry encouragement loan. Individuals depositing forestry income into an equalization reserve account. This money then earned interest at three percent and was only taxed when it was withdrawn from the account. Companies depositing money from thinning operations into an account to be carried forward free of tax. A number of the tax incentives offered to companies were the same as those that had been offered to individuals in 1949. For several reasons, this time the uptake was considerably better. Firstly, the tax benefits were more important to, and better able to be utilized by, investors than landowners. Secondly, in the 1940s and 1950s, meat and wool farming were very buoyant and timber price controls provided a considerable disincentive. Finally, in the mid-1960s, a range of other incentives also supported the tax benefits. Another option the government selected to facilitate afforestation was land lease arrangements with the Mâori. The Forest Service established and managed forests on Mâori land, and profits were to be shared between the government and the landowners. From 1967 to 1985, a number of leases involved a total of 71 000 ha of Mâori land, with around 51 000 ha planted with trees. From the governments perspective, the forests were a means of utilizing Mâori land that was otherwise unlikely to be used as productively. The initial leases were for 99-year terms, with the landowners receiving a share of stumpage in lieu of rent. The leases provided for consultation with the landowners and safeguards relating to wahi tapu (sacred) areas. Subsequent leases were for shorter terms with annual rental payments in response to Mâori wishes for greater control. Following this initiative, the private forest industry also entered into lease arrangements with Mâori landowners. In 1969, the government convened a Forestry Development Conference to assess forest resources and associated industries, and make recommendations for their expansion. The conference served to establish a common commitment to and belief in forestry as a long-term contributor to the economy, and created a sense of partnership between the government and the private sector, both large and small. At this point, the private companies took a much more significant role in afforestation. The conference considered immediate, medium- and long-term perspectives, and reported on efficiencies that could be achieved. Industry, government, the Forest Service and universities were all brought together to contribute to the planning. Export targets were doubled to over 3.7 million m3 by 1973. Further forestry conferences followed in 1974/75 and 1981. The 1974/75 conference addressed land-use policy, regional development, indigenous forest policy, forest legislation, forest industry, afforestation, short-term wood supply and recreational use of forests. The 1981 conference also addressed a wide range of issues including management practices, utilization, transport, landscape, social and environmental matters. During the 1970s, public concern over the utilization of indigenous forests grew steadily. The primary concern was clear-felling and burning of indigenous forest to enable conversion to faster growing plantations. A number of new environmental groups emerged. The Maruia Declaration was the largest petition in New Zealand with 341 159 signatures. It opposed an indigenous forest utilization and conversion proposal and was presented to parliament in 1977. The petition received little support from the government, but indigenous forestry became a major political issue. The environmental movement was generally not favourably disposed towards plantation forestry. The conferences were part of the governments efforts to try to include all relevant stakeholders, including environmental and community groups, in the planning process and to achieve a shared vision for plantation forestry development. The 1981 conference re-affirmed the expansion in the plantation estate achieved and recommended a continuation to 1990 at 43 800 ha per year to complete the goal of an estate with balanced age class distribution. Two export-focused incentives (not targeted specifically at forestry) - the Market Development Expenditure Scheme and Increased Exports Taxation Incentive (IETI) - were introduced under the Income Tax Act in the early 1960s. Under the IETI, assessable income from the increase in free-on-board (f.o.b.) value of exports over total sales can be reduced. The increase was based on the average of the first three of the last four years trading figures. Companies unable to take advantage of the benefit could elect to convert it to a tax credit at the rate of 45 cents to the dollar. Changes were made to the IETI in 1966 to deduct 15 percent of the increase in export sales over total sales based on the first three of the last five years, and again in 1972 to increase the deduction to 20 percent from the first three of the last six years. Further changes were made in 1975 to raise the deduction to 25 percent and the base to the first three of the last seven years. Export Development Grants were introduced in 1975 allowing 40 percent tax-free payments towards export development expenditure. A New Market Increased Export Taxation Incentive was also introduced. This allowed a further deduction of 15 percent of the increase in f.o.b. value of export sales if these sales were to new markets. This could be a new product to an existing market, or an existing product to a new market. An Export Performance Incentive (EPI) was introduced in 1979 under the Income Tax Act. For four years this ran concurrently with the other two export incentive schemes described above, although it was a mutually exclusive situation with potential recipients having to choose either the EPI or the other schemes. The EPI provided an incentive that was related to the total f.o.b. value of goods exported, based on their level of domestic content. The scheme comprised seven bands that ranged from the highest level of incentive (11.9 percent) for a value-added component of 80 to 100 percent, down to a rate of 1.4 percent for those goods with 0 to 20 percent added value. On average, these rates were equivalent to 14 percent of the domestic value added in each foreign exchange earned. The incentive was distributed as a tax credit. Most forest products fell into band B (70 to 80 percent), which attracted an incentive of 10.5 percent. In 1983, the EPI replaced the other two export incentive schemes. An Export Market Development Incentive introduced in 1980 under the Income Tax Act. This allowed certain expenditure related to the cost of promoting New Zealand goods and services abroad, and incurred outside New Zealand, to be eligible for a tax refund of 67.5 cents to the dollar. A programme of Export Grants introduced in 1980 to replace the New Market Development Grants and Services Export Development Grants. This was aimed at encouraging the development of new markets and provided a non-taxable rebate, available in advance, of 64 percent of eligible promotion expenditure in designated target markets. An Export Manufacturing Investment Allowance under the Income Tax Act allowed, in addition to the normal 25 percent depreciation in the first year, up to a further 20 percent of the cost of investment in plant and machinery to be deducted from assessable income. The exact amount that could be deducted depended on the proportion of the output that was destined for export. In addition, under certain circumstance, machinery used primarily for the production of export goods was eligible for Sales Tax exemption. Export Suspensory Loans allowed an exporter to borrow at commercial interest rates up to NZ$100 000 (approximately NZ$337 000 in December 2001 values) in loan finance for intensive export investment projects. Thereafter, those exporters who managed to meet a set export target for three consecutive years during a five-year period were eligible to have their loans converted to grants. Once converted, the amount was then treated as taxable income over the following three years. Provide financial forecasts for different silvicultural regimes. In 1978, the problems of analysis of the large and growing database, and effective communication of the results to forest managers were considered. As a result, the accrued knowledge was incorporated into a stand model that would simulate the entire growing, harvesting and conversion processes. At the same time, the Forest Service was becoming concerned with the proliferation of silvicultural regimes throughout New Zealand. The Radiata Pine Task Force, established at the Forest Research Institute, developed a model that simulated the growth of one hectare of tended radiata pine and then simulated the harvesting, transporting and sawing of the wood from that stand (Sutton 1984). The Forest Research Institutes services were generally provided free-of-charge to forest growers and processors until the mid-1980s. In 1980, the institutes budget was NZ$12 million (approximately NZ$40.4 million in December 2001 values), entirely funded by the government. In 1998/1999, the government invested NZ$25.4 million (approximately NZ$26.7 million in December 2001 values) in forest research (distributed among all research organizations covering indigenous and plantation forestry) and the industry invested NZ$32.6 million. After the closure of the two university forestry schools in the 1930s, New Zealand foresters were trained overseas. It was not until 1970 that a new School of Forestry opened at the University of Canterbury, offering Bachelor of Forestry Science and postgraduate study for New Zealand and overseas students. The Forest Service had a programme of sponsoring trainees for university education. It was generally accepted that some foresters trained by the Forest Service would be enticed to work for private forestry companies. Similarly, the Forest Service established forest ranger and woodsman training schools, and some trainees also went on to work in the private industry. This supply of trained personnel was another important indirect incentive that assisted the development of the plantation industry. 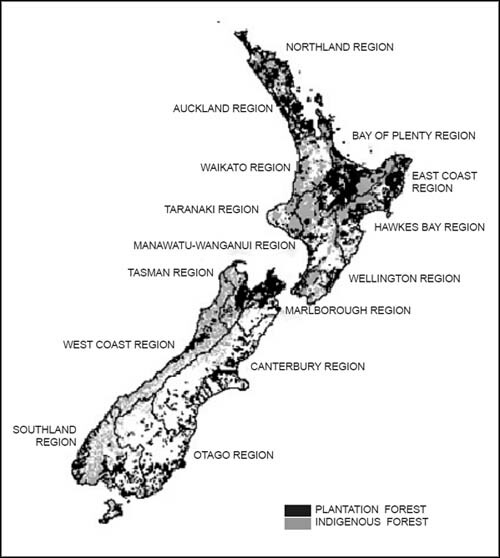 The purpose of the National Exotic Forest Description (NEFD) is to maintain an authoritative, publicly available, high quality, quantitative database of New Zealands plantation forests. The principal components of the NEFD are the forest area, age class information, yield tables and national and regional wood supply forecasts. Area and age class information is updated annually, while yield tables are revised, and wood supply forecasts are produced periodically (about every five years). Information is readily available through printed publications and the Internet. Since its inception in 1982, the NEFD has operated as a partnership between the governments forestry department and private industry. A wide range of forestry stakeholders, including central government, relies on the NEFD for monitoring, policy-making, wood supply forecasting and planning. It also plays an important role in investment analysis by the forest industry, domestically and internationally, as well the financial sector. In 1983, the Forestry Rights Registration Act was passed to facilitate the use of joint ventures for the development of plantations. The Act provided for a forestry right to be granted by the owner or lessee of land to another person to establish, maintain and harvest, or just to maintain and harvest, a crop of trees on that land. It also incorporated rights of access and provisions for payments, royalties, or a division of the crop or the proceeds from the crop. The Act also permitted the registration of a forestry right against the title of the land in question, but without the high standard of survey normally required for registering instruments against land titles. Nonetheless, companies and private investors did not invoke the Act frequently. In contrast to the earlier planting boom based on expectations of a domestic wood shortage, the second major wave of planting was initiated to meet an estimate of increased domestic needs and the development of exports. The annual planting targets were revised several times as export goals steadily grew. From the mid-1970s, the bulk of the planting was destined for export products. This time the government envisaged that these targets would be met in partnership with private forest growers. Of the initial 21 000 ha per year target, for example, the Forest Service was authorized to plant 14 500 ha per year. From 1962 to 1984, the government provided forestry loans, forestry grants and a more favourable tax regime to encourage private sector planting. Key legislation included the Farm Forests Act 1962, the Forestry Encouragement Act 1965 and the Land and Income Tax Act 1965. The target groups for these measures were farmers, local authorities, and private forestry companies. From mid-way through this period, the rate of private planting overtook government planting (Table 6). 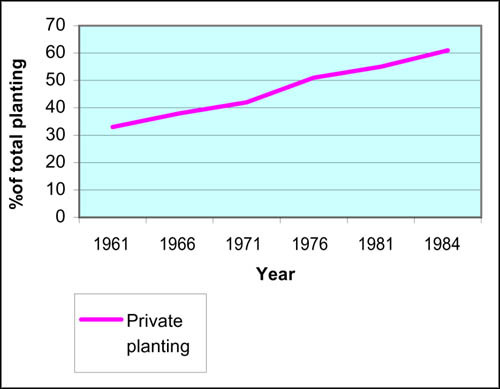 Figure 4 shows the increasing trend of private plantings. Over a 21-year period, the various grants and loans contributed greatly to new private forest plantings. Setting aside the 1983/1984 year when grants temporarily replaced the previous taxation provisions for forestry companies, the combined area planted under the grant and loan schemes was 88 509 ha. This made up a significant 28 percent of all new private plantings throughout the duration of the schemes, given that this was initially targeted at owners of small landholdings. Furthermore, the area planted was in addition to that encouraged by a range of other incentives. The impact of the grants was more considerable than the loans. For the four years where the grants and loan statistics were separated, the ratio of subsidized planting attributable to grants versus loans is in the order of 4:1. Higher subsidies were necessary to increase the annual planting rates. From about 1973 through to 1983, and despite ongoing changes being made, the contribution of the grant and loan schemes to new private sector planting remained relatively constant. Taxation measures and a range of export incentive schemes played a major role in the continued development of plantation forestry and processing industries. The dramatic increase in the level of afforestation led to greater competition for land and further debate regarding the merits and roles of forestry and agriculture. Competition for land, acrimonious debate between the farming and forest industries, and land-use controls probably limited forestry development in some districts of New Zealand. In 1984, a new government was elected and confronted with low economic growth, high inflation and an uncompetitive export sector. The policies and actions that resulted had a dramatic impact on private and public enterprises and the population at large, as a highly regulated economy moved quickly to a market-led economy. An initial 20 percent devaluation was followed in 1985 by a float of the New Zealand dollar. Export assistance, domestic subsidies, and price controls that existed on some products were removed, tariffs were lowered, and the extensive import licensing system was dismantled. Investment and land development concessions were withdrawn, the taxation law was amended and cost recovery for previously free government services was introduced. A number of government-owned businesses, including commercial forestry, were corporatized and later privatized. The rates of afforestation fell to very low levels in the late 1980s and early 1990s, then quickly rose to record levels subsequent to privatization, with further amendments to the taxation regime, and influence from an international price spike for wood. These fundamental changes to the economy created an environment that increased the relative attractiveness of forestry. Once embedded, they were a powerful stimulant to further plantation development. Government policy was also to clarify the organizational objectives of its departments and improve transparency and accountability. In 1987, the government dissolved the Forest Service and corporatized its commercial functions under a state-owned enterprise, the New Zealand Forestry Corporation. This was a limited liability company, established to manage the governments 550 000 ha of plantation forests, 142 000 ha of indigenous forest, two sawmills, nurseries and other assets. The non-commercial functions of the Forest Service were transferred to a new Department of Conservation that managed the bulk of the governments indigenous forests, and a new Ministry of Forestry that assumed forest policy, forest health and protection, and forest research functions. The Department of Conservation has no commercial wood production function. Subsequent changes saw the Forest Research Institute become an autonomous Crown research institute, and the Ministry of Forestry merge with the Ministry of Agriculture. In the same year, the government announced a privatization strategy aimed at reducing public debt substantially. The government was not seen to be the most appropriate entity to run commercial forestry businesses where management decisions were too easily influenced by political objectives. The strategy was to sell state-owned corporations, unless there were strong economic or social reasons to retain ownership. The governments 1988 budget included its commercial forest assets (with the exception of the small area of indigenous forest) among the businesses to be sold. The forest assets were intended to be sold (by open tender) in 90 units ranging from 51 to 132 112 ha in area, but some units were withheld from sale as a result of contractual, environmental and other concerns. Each unit was assigned tradable property rights (Crown Forestry Licences) containing individual terms and conditions of sale. Only the forests were sold, not the land upon which they stood. The sales left the government with less than seven percent of the national plantation forest estate. Subsequent settlements of claims under the Treaty of Waitangi have seen forest land, and some of the remaining forests and land, pass to Mâori ownership so that today the government owns about three percent of the plantation resource. In the governments 1987 budget, a significant change to the taxation legislation applicable to forestry was announced. This resulted in the removal of the provision that allowed immediate deduction of forest establishment costs against current taxable income. Most of the costs that previously qualified for deduction were to be capitalized and deducted against future income from the forest in a cost of bush account. The capitalized costs were not indexed to inflation. The change was part of a business taxation reform aimed at standardizing the tax treatment of business expenditure. The key issue was whether the long-term nature of forestry investment, and in particular the impact of inflation over time, should be taken into account in the tax regime. While the forest industry accepted the need for a neutral taxation system, it was highly critical of the cost of bush account and attributed much of the downturn in afforestation to this legislation. The Resource Management Act replaced the Town and Country Planning Act (1977) and a range of resource management legislation. It is now the principal statute for the management of land, subdivisions, water, soil resources, the coast, and air and pollution control. The legislation is primarily implemented by New Zealands local government authorities through local plans that contain policies, rules and performance standards associated with resource use. The widely varying approaches to the implementation of the Resource Management Act have resulted in considerable criticisms from the forest industry and other resource managers. Plantation forestry remains subject to inconsistent forms of control, including consent requirements, over much of New Zealands rural land under these plans. The main impact on the forest industry has been the high cost and lengthy time incurred in seeking consents, particularly for wood-processing initiatives. Prior to the sale of the governments plantation forest assets, the government owned 52 percent of the resource. The remainder was largely held by a small number of domestic corporations. An Australian company (Elders Resources) that had entered the scene in the mid-1980s was the only significant foreign investor in the industry. One major outcome of the sale was the internationalization of New Zealands plantation forests. Many companies from Asia and the United States of America have purchased plantation forest assets in the country. Subsequently, other overseas investors have also committed funds to the plantation forestry. The seven largest forest owners are currently held or controlled by foreign companies, and many other major forest owners are overseas-based enterprises. This has facilitated access to export markets and resulted in significant investment in Douglas fir plantations. Discussions from 1990 between the New Zealand Forest Owners Association (which represents owners of the large majority of plantations by area) and the principal environmental groups in New Zealand (with the exception of Greenpeace) culminated in the New Zealand Forest Accord in 1991. Essentially, forest owners agreed that they would not clear any land or disturb any area with naturally occurring indigenous vegetation (subject to definition) in return for recognition by the environmental groups that commercial plantations were an essential source of perpetually renewable fibre and energy, offering an alternative to halt the depletion of indigenous forests. This Accord marked the beginning of a greatly improved working relationship between the plantation forest owners and the environmental movement. It has subsequently been complemented by a set of Principles for Commercial Plantation Forest Management in New Zealand, agreed in 1995. At the ten-year anniversary of the signing of the Accord, the parties gathered and re-affirmed the document. The Forest Service had provided free forestry extension services. The Ministry of Forestry initially assumed this role, but the government required it to charge for its services and introduce a 100 percent cost recovery system over several years. In 1989, the government decided to exit from a service that was seen to be competing with private forestry consultants. This marked the end of one-on-one forestry advice from the governments forestry agency to private landowners. In the early to mid-1990s, the Minister of Forestry focused efforts to raise the profile of forestry and facilitate investment. The Ministry of Forestry subsequently adopted an information brokerage role and produced a range of publications on plantation forestry and investment opportunities. These publications provided information sought by forestry managers and investors, including foreign direct investors. A global price spike for wood in 1993/1994 saw some log grade prices more than double (in New Zealand dollars). This undoubtedly drove the unprecedented interest in plantation forestry in the mid-1990s despite the fact that the fast returns for the new plantings would be dependent on a price some 30 years into the future. Non-corporate private investment surged through direct investment, partnerships and the purchasing of shares. Much of the investment was superannuation motivated. The price spike also drove a dramatic increase in log exports and led to calls for government to intervene to secure supply to domestic processors, increase domestic employment opportunities and prevent a perceived overcutting of the wood resource. The government did not intervene, however. The government approach to commercial forestry throughout the 1990s was to create appropriate investment and regulatory environments, but not be directly involved in the industry. A new government elected in 1999 softened the hands-off, free market approach. The forest industry was again identified as a key contributor to economic development, particularly in some underdeveloped regions. It also became apparent that the necessary planning and infrastructure development had not been undertaken in crucial forestry growth regions to the required extent. A joint whole-of-government (coordination of all relevant government agencies) and industry Wood Processing Strategy was initiated in 2000 to address the main issues associated with biosecurity, climate change, investment promotion, labour/skills/safety, national certification, research/science/technology, the Resource Management Act, trade access, trade enhancement and transport. The broad goal is to formulate and implement integrated response strategies targeting identified development barriers to boost investment in New Zealands value-added wood processing. The corporate forestry sector responded positively to this government initiative. In particular, the direct participation of both the Deputy Prime Minister and the Minister of Forestry in the discussions was viewed as a sign of the governments commitment to the partnership approach. Funding has targeted such items as research and road construction. This financial assistance has been an important incentive, but it is clear that re-assurance by the government that it places a high value on the forest industry has been no less of an incentive, particularly to those companies with foreign ownership. Indigenous forest management, a highly political issue in the late 1970s, received special attention from the government in the late 1980s. The transfer of the bulk of the governments indigenous forest resource to the new Department of Conservation in 1987 led conservation groups to shift their focus to private indigenous forest management. The announcement of new policy initiatives in 1990 resulted in further export controls, and an amendment in 1993 to the Forests Act (1949). The amended legislation required the registration of sawmills cutting indigenous logs and the commercial harvesting of indigenous forest on private land to be under government-approved sustainable forest management plans or permits. The 142 000 ha of government-owned indigenous forest managed for timber production were mostly under a Deed of Appointment with the Crown. In 2000, the government announced that harvesting of indigenous forests from all but 12 000 ha of government-owned land would cease by March 2002. The ever-increasing restrictions on harvesting of the indigenous forest, and the development of what are effectively two distinct forest management categories, have encouraged the continuing development of the plantation industry. Exemption for the agricultural industry from any price measures in the first commitment period, provided the industry is willing to invest, in partnership with the government, in research to identify options for reducing agricultural emissions. This package is subject to further public consultation. As proposed, it has the potential to affect the forest industry principally through the charge on carbon fuels from 2008. The forest industry has expressed a number of concerns about the policy. Major environmental issues in a number of Pacific Rim countries have resulted in significant areas of their forest resources being withdrawn from commercial forest management. In particular, harvesting restrictions to protect the habitats of the northern spotted owl in the United States Pacific Northwest region and logging bans in a number of Asian countries (Durst et al. 2001) have led to enhanced market opportunities for the New Zealand forest industry. International trade negotiations have seen the reduction of tariff barriers in some markets, although escalating tariffs remain a key issue in New Zealands principal Asian markets. As tariff barriers have been reduced, non-tariff barriers have taken their place. Examples include the requirement for environmental certification, phytosanitary prerequisites, and technical barriers such as building standards. The period from 1984 to 2000 witnessed huge variations in the rate of new plantation forest establishment (Table 7), influenced by a range of factors. Previous governments that had provided a wide array of incentives were replaced in 1984 by a government that emphasized the role of the free market. The Treasury also viewed central planning and target setting as inappropriate. Notwithstanding this, the Forest Service managed to hold to its target plantings until the organization was corporatized in 1987. Thereafter new planting by the government decreased significantly and ceased in 1991. Over the same period, the private sector was also within five percent of its suggested contribution, despite the removal of incentives. * Total figure is available, statistics for state and private planting have been estimated. The termination of all subsidies and export incentives was just a part of a dramatic overhaul of the New Zealand economy to which all businesses had to adjust. There was substantial re-organization and rationalization undertaken by private enterprises (as well as government businesses) that resulted in sales and exchanges of plantation forests among companies. The sales changed the face of plantation forest ownership in New Zealand and over a period of six years essentially saw the government exit from the industry. The cost of bush taxation account had been highly contentious and was widely viewed as having severely depressed new plantings. By 1991, new plantings had dropped to 15 000 ha, the lowest level since 1966. Replanting following harvesting was the standard practice and this accounted for the majority of the planting taking place each year. A new government elected in late 1990 implemented a pre-election policy to remove the cost of bush account and re-introduce immediate deduction of qualifying costs against income from any source in 1991. The new government saw forestry as a major contributor to sustainable economic development, and the Ministry of Forestry adopted a strong focus on information brokerage and overcoming impediments to forestry development. An unprecedented log price spike, in association with the conclusion of the bulk of the asset sales and changes to the taxation regime, drove record new plantings in 1994. A generally weak New Zealand (and international) share market through the early 1990s prompted private investors to seek alternative investments. The log price spike allowed forestry investment schemes to predict very high comparative returns. It is not possible to quantify the impact of each event. Due to the removal of subsidies and export incentives, about 1.5 million ha became regarded as marginal or uneconomic for agricultural production. New land uses were required and forestry was often one of the favoured options. Woodlots and plantations also became more generally accepted as having a role in sustainable farm management. The removal of subsidies also depressed rural land prices and in turn raised the profitability of afforestation based on purchased land. Consequently, the majority of new plantings through the 1990s was undertaken by a variety of small-scale investors, rather than the government or major forestry companies. Today, 91 percent of the plantation forest resource is in private ownership and the plantation forest estate contributes 99.7 percent of New Zealands total wood harvest. Profitability ultimately determined the level of investment, i.e. it was pointless trying to encourage plantation forestry where it was not inherently viable. Most of the pre-1980 history of the development of the forest industry presented in this paper is from Allsop (1973); Kensington (1907); Kirkland and Berg (1997); Phillips Turner and Beasley (1936); Poole (1968); Poole (1969); Roche (1984); Roche (1990); Simpson (1973); Sutton (1984). Materials associated with the sale of the governments plantation forest assets are from Clarke (1999). Staff of the Ministry of Agriculture and Forestry, New Zealand. The following people reviewed and provided comments on drafts of this paper. Their contributions are gratefully acknowledged: John Eyre, Murray McAlonan, Parnell Trost, Judith Dennis, Debra Harrington (Ministry of Agriculture and Forestry, New Zealand); Thomas Enters (FAO, Bangkok); Adrian Whiteman, David Jackson, Jim Carle (FAO, Rome); Alan Ogle (Ogle Miller Consulting, New Zealand); Denis Hocking (Farm Forester, New Zealand); Mary Clarke (New Zealand Institute of Economic Research), Devendra Pandey. One acre is approximately 0.4 ha. The New Zealand currency was pounds, shillings and pence until 1967 when dollars and cents were introduced at the rate of £1 to US$2. All inflation-adjusted figures in this paper are based upon a Consumer Price Index (CPI) (All Groups) regular survey that commenced in 1914. Where the original figure predates 1914, the inflation adjustment for the intervening period is based upon an estimate of CPI trends from a 1912 Royal Commission report that detailed food and rent prices in New Zealands four main centres from 1891. A bond entitled the purchaser to an acre of land on which the issuing company would plant and manage trees for a specified period. Concern developed over the methods of promotion, inflated claims about financial returns, inappropriate expenditure and dubious transactions. This was based on the population being over five million by that time, whereas the current population is only 3.8 million. New Zealand decimalized in 1967. The currency changed from pounds, shillings and pence to dollars and cents, and units of area changed from acres to hectares. Less than three percent of the area approved by the Forest Service for assisted planting in 1982/1983 qualified under the protection/production scheme. In 1991, another amendment re-introduced immediate deductibility. See references listed under Ministry of Forestry, and Ministry of Forestry in association with other agencies, for key examples.